BUFFALO, N.Y. -- Bisons starting pitcher Tom Pannone was brilliant but Buffalo suffered a tough 4-3 loss in the opening game of the series against the Bulls. After leading for a majority of the game, the Herd was stunned by a two-run home run from Brandon Snyder that gave Durham the go-ahead run in the ninth. The Bulls scored all of their runs in the final three innings of the game. Despite the team loss, Tom Pannone, making his third start for the Bisons this season, was outstanding in eight innings pitched--his longest start of the year. "I mean I had a good three-pitch mix going. I was getting myself into good counts, getting ahead of guys," Pannone said. He carved up the Bulls with a big, bending curveball while also spotting his fastball to all parts of the plate. Pannone recorded a season-high nine strikeouts without giving up a walk. "I think the strikeouts just kind of piled up," he said. "…I think the better you pound the strike zone, you'll get deeper into the game." "All three of my outings I've had up here so far I've felt good," he said. "The results weren't the best in my second outing but I kind of used what I did in that outing to help me tonight." 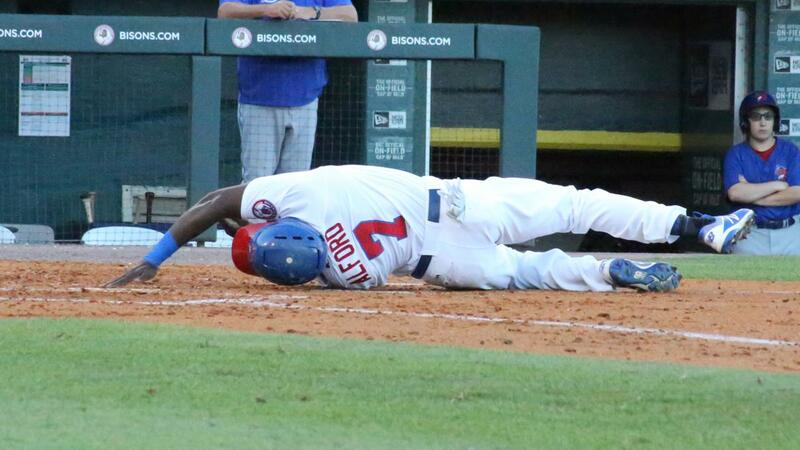 The Bisons team speed proved to be a factor in the run production Thursday night. Jonathan Davis reached base on an infield single to lead off the third. Davis, known to be a base-stealing threat, drew a couple of throw-overs from Bulls' starter Yonny Chirinos. The right-hander made an errant toss to first base which allowed Davis to move into scoring position for Dalton Pompey who knocked him in on an RBI-single. One game after Rowdy Tellez slugged a game-tying home run, he sparked a two-run inning in the fourth. He clobbered a solo blast to right center field-his eighth of the season. 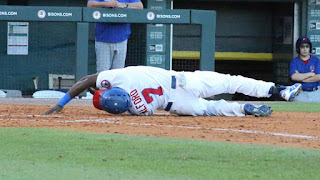 Reese McGuire put the Bisons ahead by three runs when he drove an RBI-double to the right-field corner, allowing Anthony Alford to score from first base.